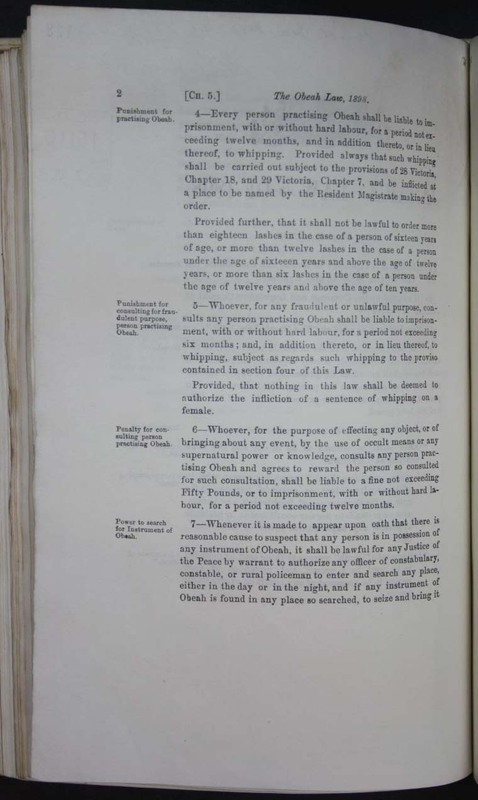 The Obeah Law passed in Jamaica in 1898 remains in force, with a few minor amendments, today. It was passed after a period during which the law regulating obeah was revised several times in quick succession. Its main purpose was to make it easier to secure convictions for obeah. It made possession of ‘instruments of obeah’–very vaguely defined as ‘any thing used, or intended to be used by a person, and pretended by such person to be possessed of any occult or supernatural power’–proof that someone was a ‘person practicing obeah’. It also made it illegal to ‘consult’ an obeah practitioner, and to publish pamphlets relating to obeah. The Act also defined ‘obeah’ and ‘myalism’ as the same thing. The Act was used as a model by the government of the Leeward Islands, which passed a similar act in 1904. In November 2012, the government of Jamaica brought forward a law to amend the Obeah Act by removing the punishment of flogging. This was part of a wider policy to remove flogging from the criminal justice system. In the parliamentary debate about the bill, former Prime Minister Edward Seaga questioned the criminalisation of myalism by the act. However, under the revised law, both obeah and ‘myalism’ would remain illegal, and punishable with a prison sentence. 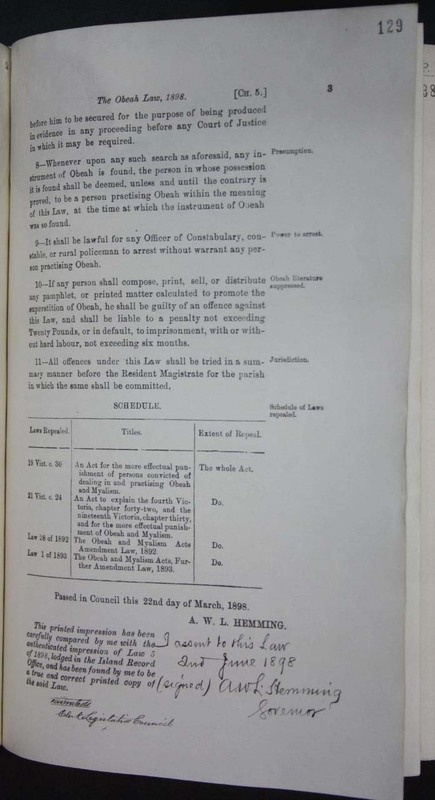 2 – The Laws mentioned in the Schedule hereto are, to the extent therein mentioned, hereby repealed; provided that such repeal hall not affect any prosecution or appeal against any conviction pending on the passing of this Law, but such prosecution and appeal shall be proceeded with as if this Law had not been passed. “Instrument of Obeah” means any thing used, or intended to be used by a person, and pretended by such person to be possessed of any occult or supernatural power. 4 – Every person practising Obeah shall be liable to imprisonment, with or without hard labour, for a period not exceeding twelve months, and in addition thereto, or in lieu thereof, to whipping. Provided always that such whipping shall be carried out subject to the provisions of 28 Victoria, Chapter 18, and 29 Victoria, Chapter 7, and be inflicted at a place to be named by the Resident Magistrate making the order. Provided further, that it shall not be lawful to order more than eighteen lashes in the case of a person of sixteen years of age, or more than twelve lashes in the case of a person under the age of sixteen years and above the age of twelve years, or more than six lashes in the case of a person under the age of twelve years and above the age of ten years. 5 – Whoever, for any fraudulent or unlawful purpose, consults any person practising Obeah shall be liable to imprisonment, with or without hard labour for a period not exceeding six months; and, in addition thereto, or in lieu thereof, to whipping, subject as regards such whipping to the proviso contained in section four of this Law. Provided, that nothing in this law shall be deemed to authorize the infliction of a sentence of whipping on a female. 6 – Whoever, for the purpose of effecting any object, or of bringing about any event, by the use of occult means or supernatural power or knowledge, consults any person practising Obeah an agrees to reward the person so consulted for such consultation, shall be liable to a fine not exceeding Fifty Pounds, or to imprisonment, with or without hard labour, for a period not exceeding twelve months. 7 – Whenever it is made to appear upon oath that there is reasonable cause to suspect that any person is in possession of any instrument of Obeah, it shall be lawful for any Justice of the Peace by warrant to authorize any officer of constabulary, constable, or rural policeman to enter and search any place, either in the day or in the night, and if any instrument of Obeah is found in any place so searched, to seize and bring it before him to be secured for the purpose of being produced in evidence in any proceeding before any Court of Justice in which it may be required. 8 – Whenever upon any such aforesaid, any instrument of Obeah is found, the person in whose possession it is found shall be deemed, unless and until the contrary is proved, to be a person practising Obeah within the meaning of this Law, at the time at which the instrument of Obeah was so found. 9 – It shall be lawful for any Officer or Constabulary, constable, or rural policeman to arrest without warrant any person practising Obeah. 10 – If any person shall compose, print, sell, or distribute any pamphlet, or printed matter calculated to promote the superstition of Obeah, he shall be guilty of an offence against this Law, and shall be liable to a penalty not exceeding Twenty Pounds, or in default, to imprisonment, with or without hard labour, not exceeding six months. 11 – All offences under this Law shall be tried in a summary manner before the Resident Magistrate for the parish in which the same shall be committed. 19 Vict. c. 30 An Act for the more effectual punishment of persons convicted of dealing in and practising Obeah and Myalism. The whole Act. 21 Vict. c. 24 An Act to explain the fourth Victoria, chapter forty-two, and the nineteenth Victoria, chapter thirty, and for the more effectual punishment of Obeah and Myalism. Do. Law 28 of 1892 The Obeah and Myalism Acts Amendment Law, 1892 Do. 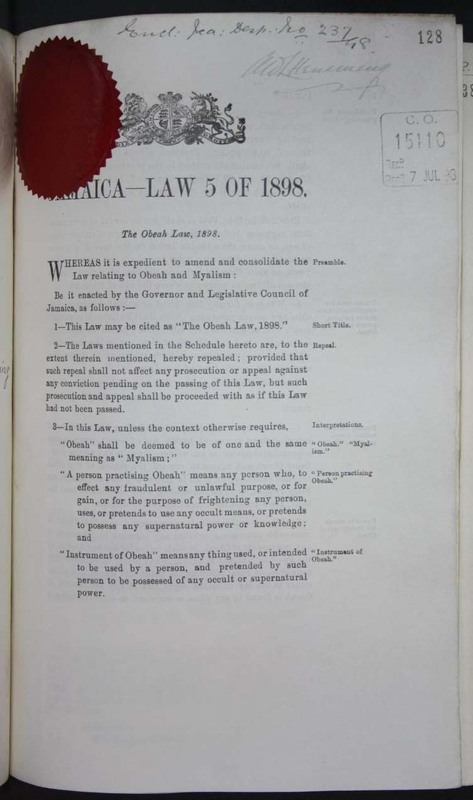 Law 1 of 1893 The Obeah and Myalism Acts, Further Amendment Law, 1893. Do. Passed in Council this 22nd day of March, 1898. The Jamaican law targets “any person who, to effect any fraudulent or unlawful purpose, or for gain, or for the purpose of frightening any person, uses, or pretends to use any occult means, or pretends to possess any supernatural power or knowledge”. In this 21st Century, where knowledge is ‘supposed’ to prevail. I cannot understand for the life of me why the two terms Obeah (which has an existing meaning) and Myalism (which is a religious practise) are terms used almost interchangeably. What are we to say to our children when they ask about our past? Should we tell them that we are still ignorant about the future? or should we just tell them that they shouldn’t ask? I agree Ms. Banks, ignorance of our history causes us to live in the shadow. In answer to Mathias, the reason why this law is wrong is because it makes illegal African practices that have existed for thousands of years. Why should western ideology and medicine be legal and African or other indigenous practices be illegal. The reason is that western science and medicine cannot explain these practices nor account for their efficacy. Therefore, what they don’t understand they ban. What they describe to me is/was the description of there religion. What were they afraid of? The Haitians used what they call obeah to free themselves from slavery. The with ignorance the accepted the Christian religion and have been in CAPTIVITY ever since.We have to ask ourselves what power did we have that they were so and still afraid off? Why are we afraid of something that is ours and we know so little about? Most African religion are now being practice by the European. If you want to know anything about it you have to go to them and lear the watered down vergin of what is rightfully yours. WAKE UP my people stop being AFRAID of yourself.